Featured Image. Photo by Sean McFarland. Written and Media by Sean McFarland. I know starting any good paper with a quote may be frowned upon by some, but what other way to begin an article about the Lifestyle Statement other than quoting the Lifestyle Statement itself? Before reading any further, please take a moment to reflect on what first comes to mind when you think of “The Lifestyle Statement”. What is the purpose of the Lifestyle Statement? Why do Greenville College students need to go to chapel? Why can’t I do the things that my friends do at other schools? Student questions just like these were each answered at the last and final Fireside Chat of the semester. 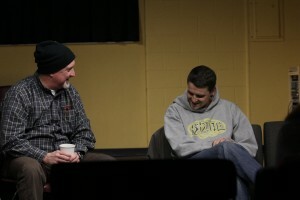 Greenville College students and faculty discussed the many wonders of the Lifestyle Statement. Norm Hall and Tim Caldwell lead a “Fireside Chat”. 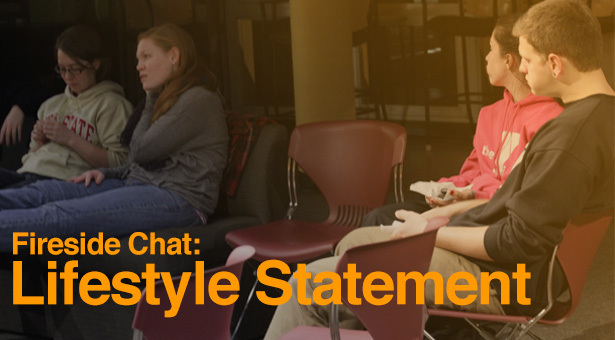 This past Tuesday, Tim Caldwell and Norm Hall gathered with a handful of Greenville College students in the Upper Union where the the ins and outs of the Lifestyle Statement were openly discussed. The following podcast includes Betsy Wagoner and Nathan Hood giving their opinions of the Fireside Chat along with Tim Caldwell and Norm Hall speaking on The Lifestyle Statement. During this Fireside Chat, Tim and Norm made it very clear that the Lifestyle Statement is not just a set of rules in order to catch students doing bad things, but a tool to create the space necessary for great things to run wild. This was reiterated multiple times during the discussion in order to make it clear that the faculty and staff here at Greenville College are more than just professors, CREs, and administrators. They are a part of our community. These individuals are willing to reach out to any student in any situation. Whether it be academically or spiritually, they are here for us. 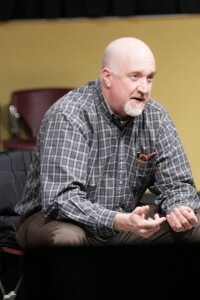 Norm Hall answers questions at Fireside chat. Some of the main topics that were brought up by students at the discussion were questions about chapel, drinking and tobacco use, and about students who have yet to realize their path here at Greenville College. As Nathan Hood said in his interview, chapel is the part of the day where the Greenville College community can take time to worship together before most classes start. The students who attend chapel regularly know that chapel is a great place to be informed on events in order to get more involved on campus. Chapel is not only a great place to be informed about campus events, but also a great environment to meet new people! As the discussion went on, Tim and Norm also brought up the issue that many college students here at Greenville College are 21 years old or older. 21 is obviously the age to legally purchase and consume alcoholic beverages. Tim went into further detail about how alcohol isn’t a big, horrible thing for most people in moderation, but according to the statistics, alcohol has negative implications for the academic environment regardless of the moderation. The same applies for tobacco use. (Listen to podcast for further discussion of drinking and tobacco use.) This is a large part of why Greenville College abstains from the use of alcohol and tobacco. Wrapping up the Fireside Chat, the conversation turned to when students struggle with what Greenville College is really about and if Greenville College is the right fit for them. As we go through the educational experience, we are learning more about ourselves everyday. With that said, this last topic was left open for students to chime in, stating their own experience as they have learned how they fit into the Greenville College community. Overall, these topics can all be related back to how the Lifestyle Statement can help Greenville College students self-discipline themselves in order to become self-satisfied in all of their actions throughout college.